Khatron Ke Khiladi – Darr Ka Blockbuster returns is in the 6th week on Colors and have reached the mid way of its total run. The difficulty level in the stunts have gone up much in comparison to last week. There is a special car stunt with a car specially designed and the contestant going to drive it by sitting at an altitude of 6 to 8 feet. Upon pressing the brake, the car instead of stopping it will make a dip to hit the ground giving some shock to the driver – Bull’s eye stunt. Hussain is one of the contestants performing this stunt. In another stunt, the contestant need to climb an aerial hanging container with a ladder and upon reaching there cross to the other corner and climb with second ladder to reach the top. Next, unlocking the cover to go inside it to ignite so as to develop the thrust needed to evict from the container with force. Asha does this stunt with her agility and determination. The stunts were also done in pair with Meiyang-Iqbal, Sana-Asha, Sagarika-Rakesh. Iqbal and Meiyang’s stunt is composed of 2 steps, for the 1st one, Meiyang was hanging upside down while doing a water stunt, and in the 2nd step both needs to complete some task by reaching to some post. The results show that Asha, Sana, Riddhi, Iqbal, Chang and Natalia are the contestants getting Fear Fundas and thus will get another chance before going to participate in elimination round. Asha faces the stunt before the elimination round and its very challenging since in a controlled environment she needs to cover some distance to transfer meat to other corner. She has to consolidate herself against a trained & monitored lion which chases the meat attached to the rope tied to her body. Asha is in completely protective clothes but gets bit hurt with those pushes that makes her hit to the ground. For the elimination stunt, Riddhi goes to perform a glass chamber stunt where she lies down covered with python snake, snakes and moreover there are many small snakes lying close by, cockroaches, bees and other insects. She needs to pick up some fruit from there but she breaks down after not managing to stay there. Riddhi’s determination even in tough state is seen there and she pleads for stopping the stunt. Natalia was also feeling afraid and cries before the same elimination stunt but she goes ahead to perform with determination. 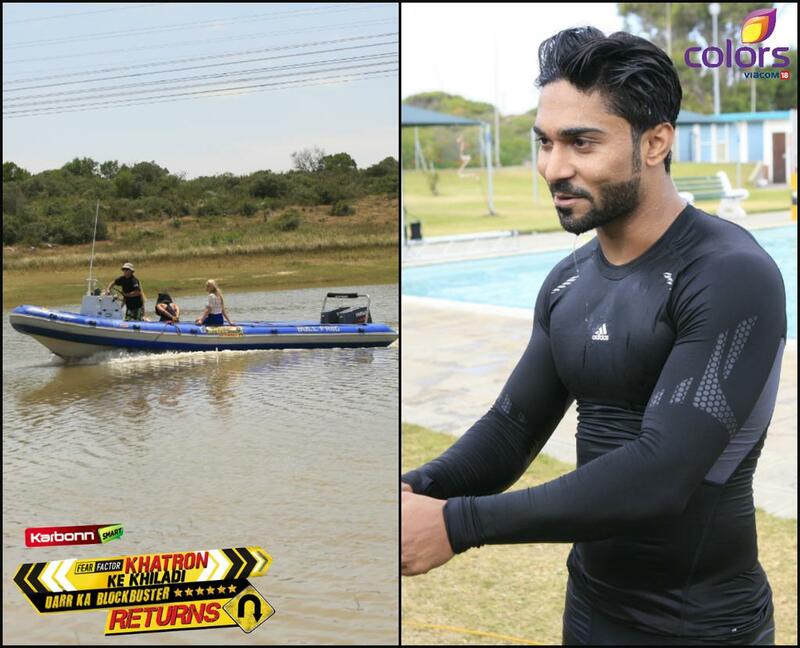 Rohit introduces the wild card contestant Salman Yusuff Khan to all the contestants, and he marks his entry by coming out of water. Salman is going to compete with other contestants from now on. He teases the contestants about his special move with 10 spins which tests on how you to control balance. Ashish and Sana get much dizziness with that special move but have fun. There was some more fun moments on the show with Asha, Ashish and Riddhi participating in a sack race. Stay tuned to KKK6 on Colors TV.